ST Mary’s Church has been transported across the Coomera River on the Gold Coast for the second time in 115 years. Built at Upper Coomera in 1890, it was relocated by truck across the river to Oxenford in 1935. It was moved back to Upper Coomera last week to again be at the hub of the parish. 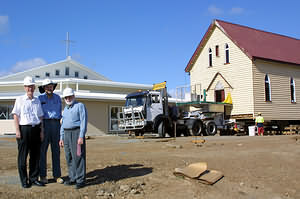 The church is being re-established at a different part of Upper Coomera to its original site. It will be a feature of a site that includes Assisi College and the new St Mary’s Community and Worship Centre. Oxenford parish priest Fr Gerry Hefferan said the late Archbishop James Duhig of Brisbane had St Mary’s moved to Oxenford so that it would be close to the old Pacific Highway. The church was renovated and extended on the Oxenford site. Fr Hefferan said the Blessed Sacrament would be reserved in the old church, which would be a place of prayer. Archbishop John Bathersby of Brisbane will visit the parish on April 10 for the re-opening of St Mary’s Church and the blessing of the community and worship centre.